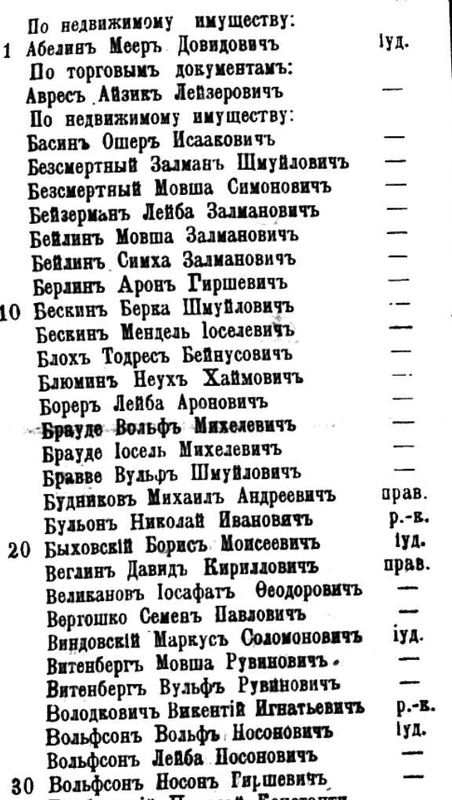 I have gathered duma lists (voter lists) for the city of Vitebsk from 1905 through 1912, which include many (but not all) adult men living in the city at the time. Many of those lists indicate the religion of the voter, which enables us to identify the Jews and create a searchable list of them. (For now, I will not be uploading any lists that do not identify the voters' religion.) There are not many publicly available records from Vitebsk, so this will be a valuable resource. This project involves the indexing of just the first portion of the 1907 duma lists. 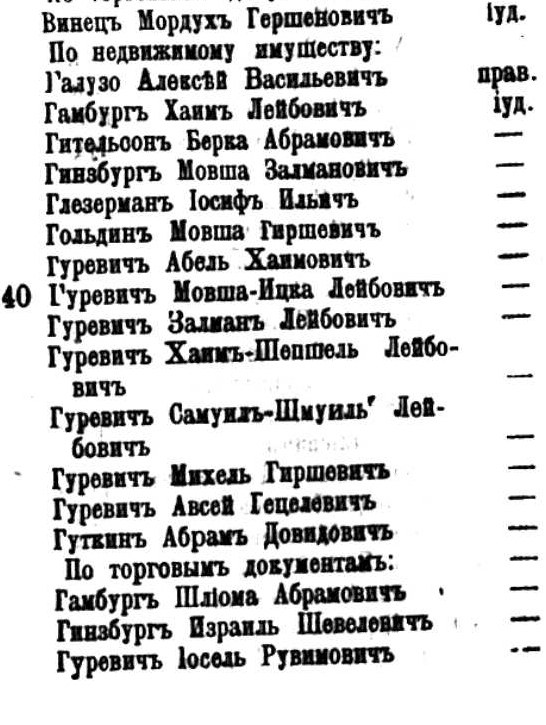 Please transcribe the names of all the Jews listed using the Cyrillic alphabet. For each name, please note the line number, the surname, the personal name, and the patronymic. If you don't have a Cyrillic keyboard installed on your computer, you can use the keyboard functionality available through Google Translate (https://translate.google.com/) or one of many other Cyrillic keyboards available online. Line numbers appear to the left of the names (with every 10th person numbered). Surname is the first name that is listed, followed by the personal name and then the patronymic. As an example, in the first sample image linked above, the first line displayed is line 1, which includes the surname "Абелинъ", the personal name "Мееръ", and the patronymic "Довидовичъ". Each individual's religion is indicated to the right of their name, with Jews being marked by the abbreviation "іуд." If a dash appears to the right of a person's name, it means that they have the same religion as the person above them on the list. As I said, please only transcribe the Jews on this list. Lines that begin with the word "По" and which end with a colon (:) are not names and should be ignored for all purposes (including line numbers).